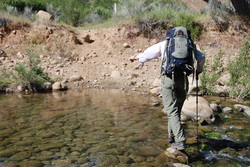 Our group on the Pine Mountain Trail in 2008. David really likes to laugh at his own nature puns. 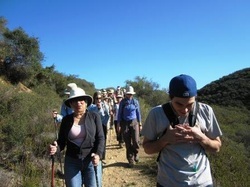 Our group on their first trail in 2011. 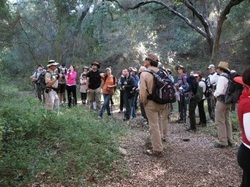 Our guide Michael is giving a lesson on the local ecosystem. 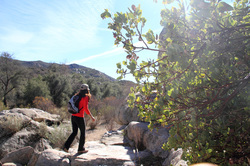 Sharon is enjoying the beauty of the local vegetation. 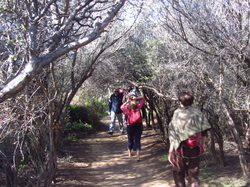 This chaparral tunnel was one of several attractions that group members really enjoyed and remembered. Mr. Langley really does not want to get wet.